Each fiscal year Meridian welcomes over 1,500 international visitors via the International Visitor Leadership Program (IVLP) on a professional exchange visit to the U.S. that could last from just a few days to three weeks. Our programming teams work closely with the U.S. Department of State and Global Ties U.S. Community Based Members (CBMs) to build outstanding programs that include not only meetings with counterparts, but also opportunities to get to know Americans in their homes and during volunteer events in local communities across the country. This blog entry is an effort to convey the diverse makeup of our visitors and their unique experiences. In this past year, Meridian welcomed visitors from 164 nations, transnational organizations, and other territories. The map below provides a visual interpretation of these visitors and their respective origin countries. 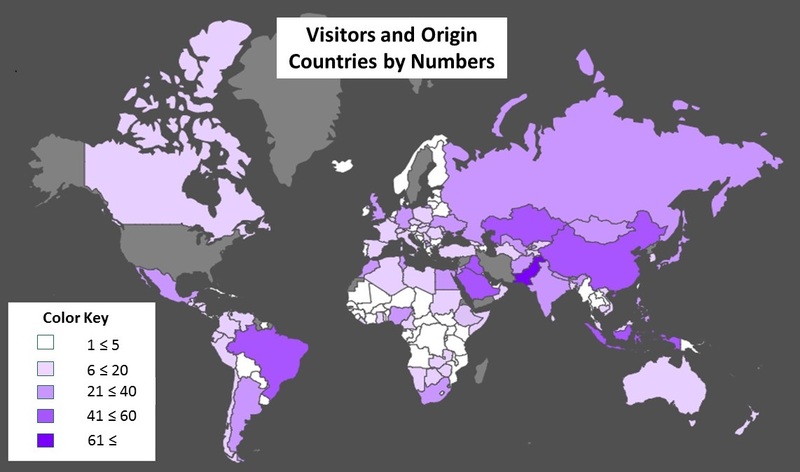 The “Color Key” represents the number of participating visitors from their respective origin countries. Map was made with support from amcharts.com. Next, we will take a look at thematic areas, or the reasons why these visitors traveled to the U.S. in FY17. Each project varied in size (some included just one visitor, while others included up to 30 participants) and overall theme. 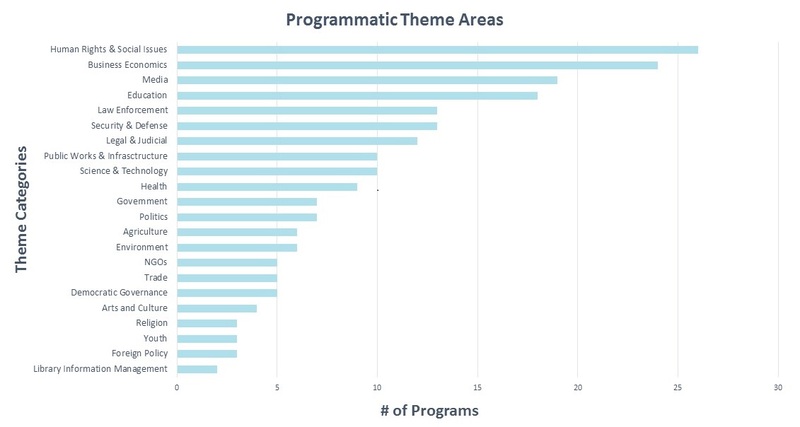 The following chart reveals the main project themes for the year. 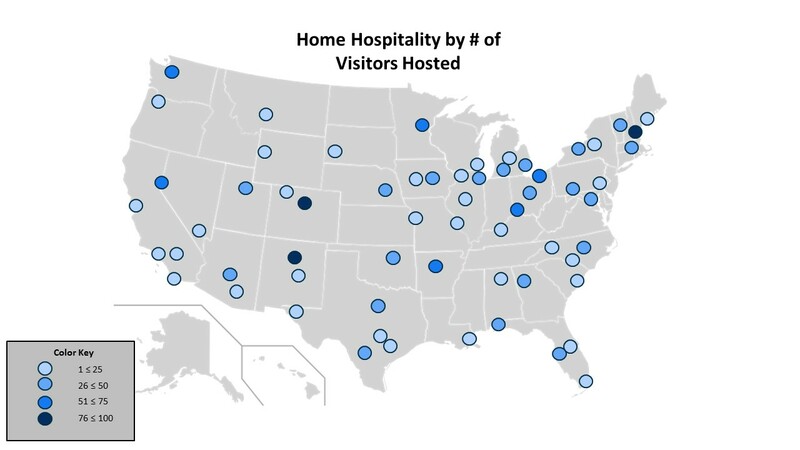 In addition to program themes and visitor numbers, we tracked home hospitality,* which provides an opportunity for visitors to sit down and share a meal with residents of the cities they visit. The American hosts are volunteers familiar with their local communities and eager to meet incoming participants in an informal setting. For this blog entry, we examined both national and local itineraries to identify cities that organized home hospitality for participants. The following image provides an idea of where participants had home hospitality during the last fiscal year. *Not all CBMs are asked to arrange home hospitality. Numbers reflect those that were contacted for home hospitality and were able to organize it for visiting groups or individual international visitors. The “Color Key” represents the number of visitors participating in home hospitality. There are 63 cities listed. Finally, we sought to analyze the impact of volunteer activities* participants engaged in over the past year. We concluded that 405 visitors and 108 international visitor liaisons and/or interpreters worked to contribute a total of 1,125 service hours across the U.S. 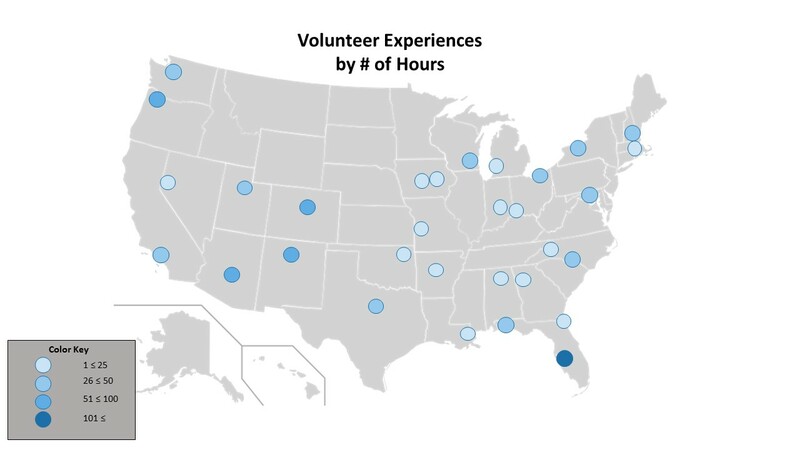 The following image provides an idea of where participants and liaisons volunteered, and the number of hours spent engaged in volunteer activities. *Not all CBMs are asked to arrange volunteer opportunities. Numbers below reflect those that were contacted for volunteer opportunities and were able to organize it for visiting international participants. In total, 56 volunteer opportunities were organized in 31 cities. The greatest amount of volunteer hours were completed in Tampa/St. Petersburg. Portland, Cleveland, and Santa Fe were also responsible for a majority of hours served. Participants engaged in activities such as helping to run the Bay View Bash’s Zero Waste Festival in Milwaukee, sorting medical supplies with Medwish International in Cleveland, sowing wild sea oats on the beaches of Tampa/St. Petersburg, assisting in the administrative duties for the Folk Art Festival in Santa Fe, and serving lunch to the homeless with Chief Seattle Club in Seattle. POST TAGS: Exchange, Global Ties U.S., International Exchange, International Visitors, Meridian Alumni, Meridian Impact, Meridian International Center, Professional Exchange, Public Diplomacy, Soft Power, U.S. Department of State.